Technology is a help as much as it is a hindrance. While we have used countless forms of technology to fuel our efficiency, organization, communication with one another and the way we impact the world, we have also lost some essential and valuable skills along the way. What skills have suffered? Mostly our people skills and soft skills, but also a few others you might not expect! 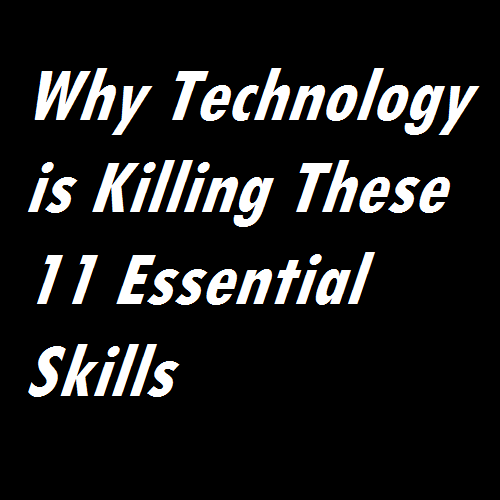 Let’s take at a look at the 11 skills that technology is killing and see if they apply to you as well. I certainly hope I’m not the only one who doesn’t recognize my own handwriting on the rare occasion I need to send a written letter or jot down some notes. There are really limited instances that don’t allow for a keyboard to make our thoughts legible. While technology certainly provides ease and efficiency of writing, quality penmanship has become a lost art. Why does this matter? There will always be instances when a pen and pencil yield a more “personal” product, like a thank you note. There will also be times when we simply will run out of battery or WiFi and need to ask for some paper to capture important thoughts. We have the ability to communicate with more people than ever on a daily basis. Yet, this has made these countless interactions feel less personal. Contributing your opinion to an online thread of thousands of comments is nowhere near as direct and meaningful as a face-to-face conversation with someone over a cup of coffee. I’ve found that people are so engrossed in their technology, catching up on email or social networks as they walk to and from their next destination, that they forget to look up and see the “real life” people standing around them. The result? We forgot to look into someone’s eyes when we are talking to them. Do you greet your cashier by looking him in the eye and asking “How are you?” Do you keep eye contact with someone as they answer your question? If not, these are all areas we should strive to improve by unplugging from technology and plugging into one another. For most career-minded individuals, networking and meeting new people is essential for growing your business. This often means making a lot of small talk. But quality small talk requires more than just asking someone the obligatory “How are you today?” or commenting on the weather. It requires attention to the situation and nonverbal cues that tell us what will engage that person. Technology has distracted and disconnected us from the living, breathing world around us so much that we have lost the valuable skill of being able to have an off-the-cuff conversation with a complete stranger. I am not too proud (though embarrassed) to admit that my basic math skills are severely lacking. Funny enough, I do still know my times tables and have not forgotten how to add or subtract. What I’ve lost is my confidence and patience to do the work mentally. Why? Because of technology. Why spend twice the time coming up with an answer I am only 50% sure is correct when I can just whip out my phone, punch in some numbers and have full confidence in the right answer? This, of course, is a dangerous mindset and one that will continue to spread from generation to generation as technology only becomes increasingly convenient and ever-present. The solution is not easy, but it can start with each of us personally. We should take pride in keeping our basic math skills sharp and utilize them even if it means taking a few extra minutes and double-checking our answers. Social awareness is the modern day way to say common courtesy. As the result of our obsession with and reliance upon technology, we forget there are other humans around us. The most common examples I’ve come across are people forgetting to hold the door, stepping in front of a line of waiting customers and cutting people off with a grocery cart. While these are simple scenarios, they do indicate a larger social problem. We are so consumed in our own (online) lives that we ignore the need to courtesy coexist with one another. If you were without your cell phone and needed to call your closest friends and family, would you know their phone numbers by memory? Probably not! I know I have exactly two phone numbers memorized aside from my own, my childhood home phone and my husband’s cell. This means I couldn’t even call my own parents’ cell phones without referencing my contact list. Technology is a great tool for storing important information and phone numbers are just one of countless examples. But think about how we also Google everything imaginable – even common things like the meaning of an acronym or the year WWII began. If we lost access to all technology, would we, as adults, be “smarter than a 5th grader?” I’m not so sure. This skill is one I really see the importance of as an introvert, yet I don’t always practice it. Think of your work environment. Do you always need some sort of background noise like a radio or TV? When walking from one place to another, do you feel the desire to talk to someone on the phone or pop in your headphones? When is the last time you did anything (aside from sleeping) in complete silence for more than an hour? Appreciating silence is an important skill because it forces us to clear out the mental clutter, listen to our thoughts and address issues that might be bugging us. All of these things are easily masked by technology and noise – but will cause stress and distraction if not given proper attention. Similarly to feeling uncomfortable in complete silence, how do you react to waiting for someone or something without any technology to distract you? I know if I am waiting for a client, a food order or to be called back for an appointment, I feel the need to read emails, check in on social media or catch up on texts. There’s a level of efficiency with this, but that is soon fulfilled within a few minutes. The issue is when we aimlessly browse our phones or tablets as a distraction from the world around us. The next time you’re waiting for someone to meet you in a coffee shop, enjoy sipping your coffee and watching the real world unfold. It’s amazing what you’ll see that you would have missed otherwise! When making social plans on the weekend, I’ve often wondered what people did before cell phones when it came to changing plans or running late. From asking enough of my “older peers,” I’ve come to the conclusion that people simply did a better job of sticking to their original plans! Thanks to technology we have the ability to endlessly change where we’re going, at what time and with whom. If you’re on the receiving end of all of these changes it’s frustrating to say the least. Back before cell phones and social media, once people left the house, they were expected to be where they said they were going – and they really made a better effort of honoring that. Using multitasking to be more efficient with your time is a huge myth. Why? We’re not machines. We cannot quickly or easily switch from one task to another without losing momentum in the process. When we multitask and try to do too many things at once, we don’t fully accomplish anything. Technology has created an environment where it’s easy to multitask and pile on distraction upon distraction. One time I caught myself watching TV while surfing my iPad. I couldn’t remember what show I was watching and I had minimal recollection of what I was looking at on social media. Trying to multitask my leisure time was a moment of reckoning for me. We need to get back to applying our sole focus to one thing at a time, doing it well and moving on to the next task with a clear mind. Finally and most importantly, our reliance upon technology has messed with our ability to feel content. This is a bold claim, but one I strongly believe is true. How do you feel when you surf social media? In seeing other people’s lives (which are inevitably a carefully framed highlight reel of the truth), how do you feel about your own? Recently there have been more and more times that I have felt worse after browsing social media – not relaxed or entertained, like I had hoped. Technology provides us a big, open window into each other’s’ lives. As we peer through, we can’t help but compare what we see to our own reality. Using technology for this purpose fuels jealously, discontent and stress. The skill we really need to strengthen is our ability to be happy for one another while being equally happy for ourselves. We are all blessed in different ways! Has the overuse of technology hindered some of these valuable skills for you personally? Or does this apply to someone you know? Share your experiences by commenting below! Excellent post and so very true! Not sure what we can do about these issues however and people who grow up with technology have not idea what any of this means as they know no different. That is the scary part! Thank you for the comment! I agree that new generations will grow up never knowing the difference, just as I’m sure we have heard our elder generations talk about the “luxuries” we’ve each grown up with compared to them. I just heard that in one of our local schools they are not even teaching cursive anymore – not that I really remember many of the letter myself! Still, it’s important we take note of these gradual changes and fight for what we feel is important for our next generations to know and appreciate. Great article, but it seems that needs presenting some positive aspects given by promotion/introduction of new technologies. I remember big discussions from 60s in Poland when ball-pens were replacing traditional ink-pens – concerning kids and their lost ability in mastering calligraphic skills. Who cares about it now? I saw a young 10 year old boy addicted to computer games and was feeling sorry for his mom as this extreme addiction had bad influence for his school performance as generated many family conflicts at that time. I saw him one month ago after 13 years and he finished university as now starts two master programs – his ability of multitasks work, fast acting and high concentration skills are amazing. Wasn’t it helped by the computer games? I do not know, but it is sure that life of modern people using those all new gadgets is much faster what means that in one life people can have a few lives at the same time. Isn’t it the same/similar as living longer? BTW, I still do not have a cellular phone and use old computer with the XP operating system, but at the same time are very careful about criticizing the new technologies. Nobody knows, if my long meditations and other traditional ‘things’ would be much faster achieved/performed if I was ‘living faster’ by/with consistent use of the the latest gadgets. I LOVE this article! Ironically, my career has been on a computer for 20 years now…yet I always “unplug”. I have a basic cellphone (text only, mainly to my wife) and a desktop. Nothing else. I look at these zombies and feel pity for them. They have no clue what it’s like to just “show up” at a friends and hang out to talk. It’s sad. The narcissists that almost kill me daily on my commute, while they are looking at their all too precious phone instead of the road, are the ones I have no empathy for however. The 20 something crowd I encounter are exactly as you described too, slamming doors in my face, not even saying “thank you” or making eye contact when I hold the door for them, all over my back in line (personal space?) because they are on their phone, etc. This tech has also taken away a crucial thing…creativity. How can you be creative when you have no imagination left? When everything is fed to you, 24 hrs a day? You simply cannot. I too am an introvert and love my quiet time, my personal time. Reading this was like I wrote it, but well you are a skilled writer and I am not LOL. For me the best way I achieve silence appreciation is on long road trips. Don’t turn on the radio or your Ipod. Just listen to the silence within your vehicle and let the hum of the engine (if you’re engine runs smoothly and not like a stock car) and just watch the passing of the road wash away your worries and concerns. It’s a prime time to meditate and just unplug for long while. An excellent post from Stephanie that offers lots of food for thought. As technology evolves so is our lives. The impact on our societal norm and value can never be understated. Similarly, technological progress inevitably disrupts. Something will be lost. Do you agree with Stephanie that these skills are indeed essential?